While many dog bites occur each day in the United States, very few of them make the news. However, one story from the Citizen Times was a bit more newsworthy. For one thing, the victim is a disabled army veteran who recently underwent a total knee replacement at the VA hospital. Victim was leaving a local pet store, which he went to get food for his girlfriend’s dog. He reportedly stepped outside of the store, he heard a dog barking. He didn’t think much of it, because it was common for dogs at the pet shop to bark at each other. Before he knew it, a 75-pound boxer had bitten him in the knee he just had replaced and was shaking as hard as it could. He fell to the ground, and the dog got on top of him and continued to bite his leg. What makes this story somewhat unique is the dog was on a leash. The woman holding the other end of the leash was allegedly talking on her cellphone at the time her dog attacked the man. When dog owner realized her dog was attacking victim, she pulled him off the man and said she was sorry. She then told victim to wait as she put the dog in her car and then would come back to him. However, she did not come back to him. Instead she allegedly got into her car after putting the dog in and drove away from the scene. When victim was taken to the hospital, he had open puncture wounds on his knee. 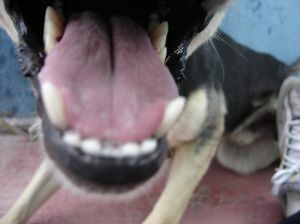 Since the dog and its owner were not found, doctors had to order a full round of rabies treatment for victim. This is an extremely painful round of treatment, which costs $17,000. Even after his insurance company adjusted the bill and paid their share, he still owed $800, which, as disabled veteran, he doesn’t have. During his interview for the news article, he said the rabies shots were awful and hurt a great deal. He said the shots were given in rounds of treatment and hurt each time until his body adjusted to the dosage. Victim suspects she fled because she was worried about losing her dog, but he said he could not believe she just ran off like that. He said the store seemed more concerned about losing a customer than they did about finding the dog’s owner. However the store management is on record disputing that claim by victim. As our Boston dog bite injury attorneys can explain, any animal bite injury can be extremely traumatic to a victim. They can result in significant pain and suffering, lost time from work, expensive and painful rabies treatments, and often leave victims with permanent scars and other disfigurement. The laws involving bites from domestic animals can be fairly complex in the Commonwealth of Massachusetts, so you should make sure your attorney has experience in this area. If the animal that bit you was not a common domestic animal like a dog, but an exotic or illegal animal, they may treat these cases differently as well.